Unicaja Malaga kept its chances to finish first in Group B by downing Alba Berlin 63-74 in the German capital on Thursday. Unicaja improved to 7-2 and is tied for first place with Maccabi Electra Tel Aviv. 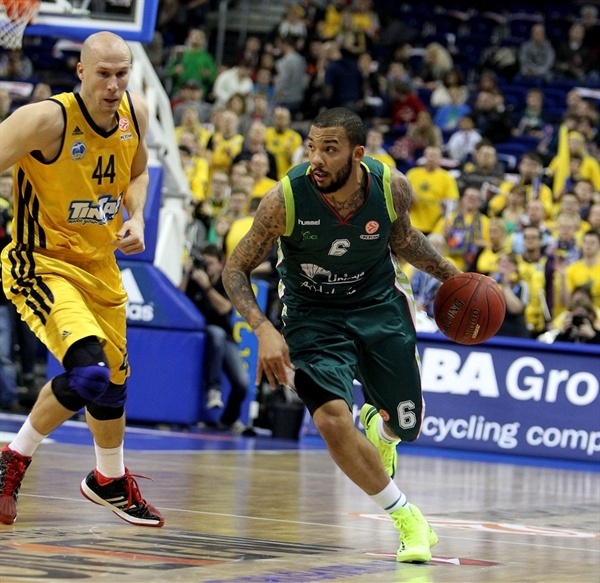 Unicaja will win Group A if it beats Elan Chalon-sur-Saone next week and Alba beats Maccabi. Alba dropped to 4-5 and ranks fourth overall. 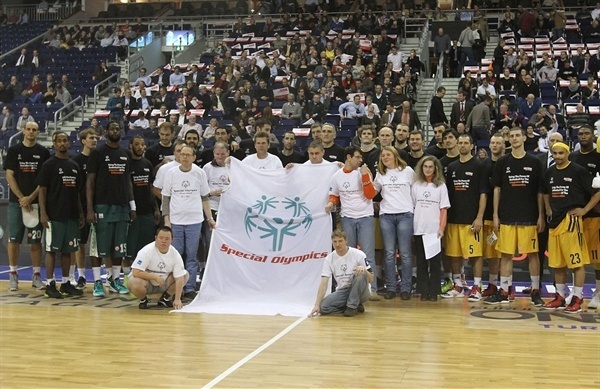 Both teams were already qualified to the Top 16 before the game. 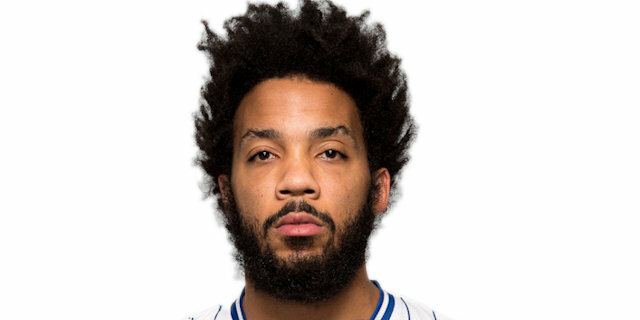 Marcus Williams paced the winners with 16 points. Luka Zoric added 11 for Unicaja. Sven Schultze led Alba with 12 points while Derrick Byars and Yassin Idbihi each added 11 for the hosts. Idbihi added 12 rebounds for a double-double. Albert Miralles and Nihad Djedovic fueled an early 11-0 run that allowed Alba to take an 18-14 edge after 10 minutes. Unicaja improved its defense and found a go-to guy in James Gist, who got some help from Earl Calloway and Krunoslav Simon to put the guests ahead, 35-36, at halftime. 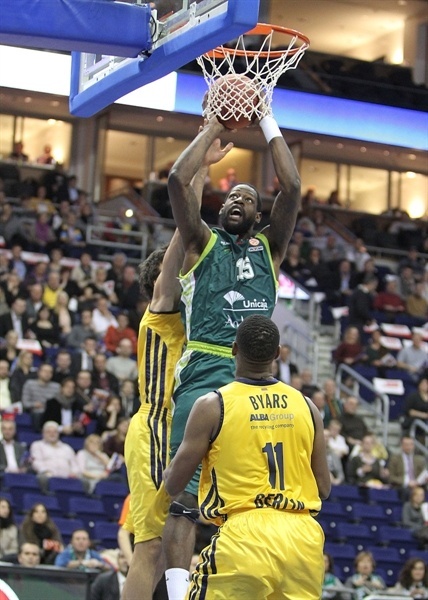 Schultze shined after the break to give Alba a 49-41 margin, but Williams had 10 points in a 0-14 run that put Unicaja ahead for good, 49-55, late in the third quarter. Unicaja boosted its margin to 58-69 and cruised to its fourth road win this season. James Gist got Unicaja going with a free throw, as Alba tried a small starting lineup with Zach Morley at power forward. Derrick Byars hit a five-meter jumper and a three-point play by Albert Miralles gave Alba a 5-1 lead. Nihad Djedovic shined with a put-back layup. Miralles made free throws and a put-back dunk by Morley capped an 11-0 Alba run. 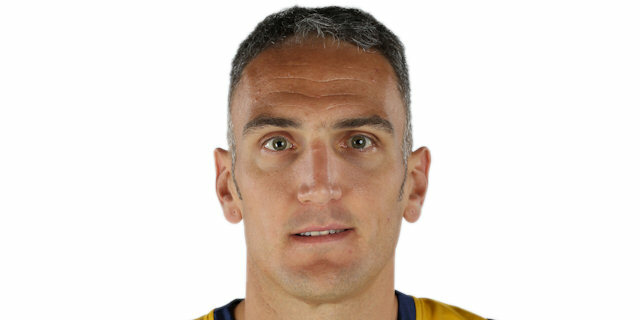 Kosta Perovic tried to change things with a five-meter jumper and a layup. The guests entered the foul bonus and Alba tried to make the most out of it. 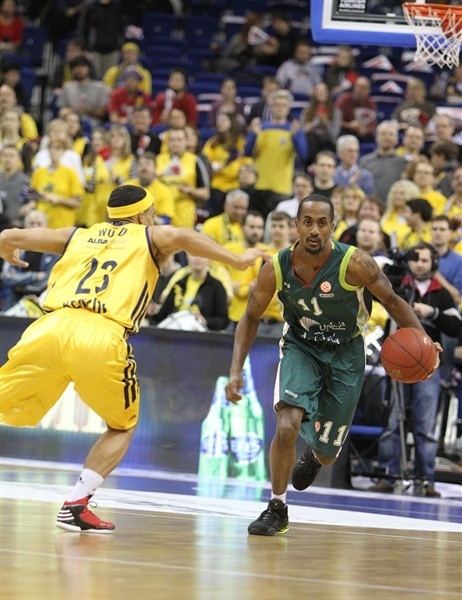 Morley hit free throws, but a three-pointer by Earl Calloway brought Unicaja a bit closer, 13-8. DaShaun Wood answered from downtown. Augusto Cesar Lima split foul shots and a layup by Yassin Ibdihi made it a 9-point game. Lima kept pacing Unicaja with a layup and a three-pointer by Sergi Vidal gave the guests some fresh air at 18-14 at the end of the first quarter. Idbihi stepped up with a put-back basket early in the second quarter, which Txemi Urtasun erased with a fast break layup. Byars ignited the crowd with a corner triple. 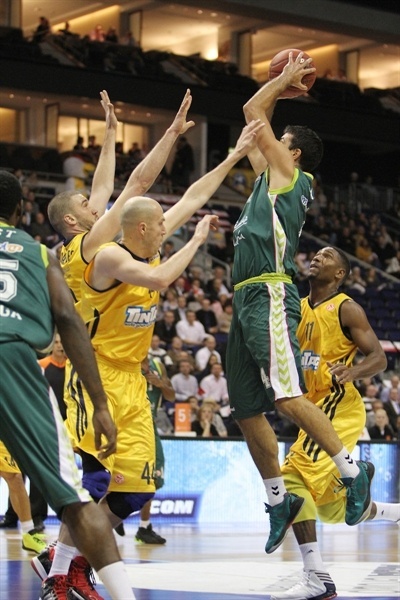 Urtasun quickly answered with a long two-pointer that kept Unicaja within 23-18. Djedovic shined with a driving layup only to see Marcus Williams bury a three-pointer. Vule Avdalovic fed Miralles for a wild dunk, but free throws by Krunoslav Simon and James Gist made it 27-24. Idbihi scored down low, however Alba kept missing open shots. 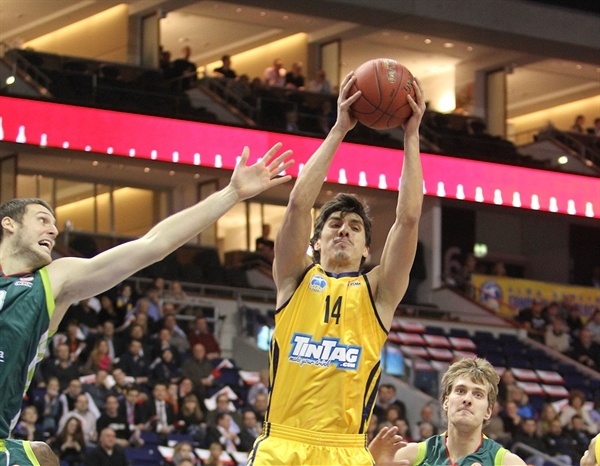 Avdalovic made free throws and Djedovic followed Gist's three-pointer with more foul shots. Simon shined with a floating layup and Gist buried another triple from the same exact stop to make it a 1-point game. 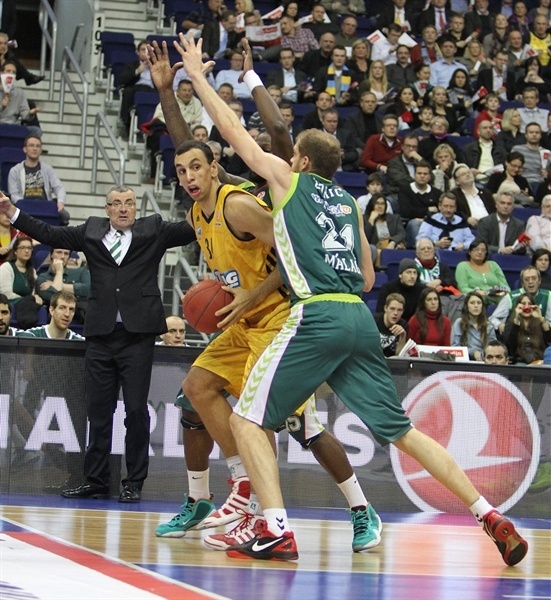 Alba kept struggling to score and free throws by Calloway completed Unicaja's comeback, 33-34. Idbihi rescued Alba with a backdoor layup, which Simon erased with a put-back basket for a 35-36 Unicaja edge at halftime. Byars shined with a backdoor layup immediately after the break, as Unicaja was held scoreless for more than two minutes. Calloway stepped up with a layup off a steal, but Ibdihi insisted with another basket and Byars added free throws for a 41-38 Alba lead. Sven Schultze took over with a bomb from downtown before Unicaja called timeout down 6. Simon buried a corner triple right before fouling out. Schultze followed free throws with a rainbow jumper to boost the hosts' lead to 49-41. Williams tried to change things with a three-pointer and a fast break layup, as Unicaja improved with a 2-3 zone defense. Williams took over with a wild driving layup off a timeout and free throws by Zoric put the guests back ahead, 49-50. 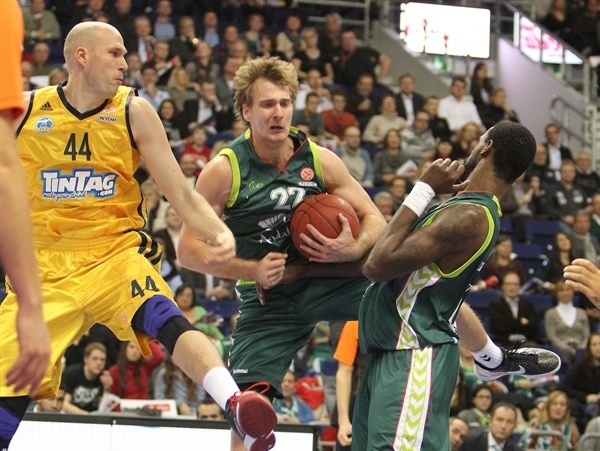 Williams struck from downtown and a fast break layup by Zoran Dragic boosted Unicaja's lead to 49-55, after a 0-14 run. Schultze scored down low, but Lima matched that with a six-meter jumper and free throws by Vidal fixed the score at 51-59 through three quarters. Byars scored in penetration early in the fourth quarter and a three-pointer by Schultze gave Alba some hope at 56-60. An unstoppable Williams quickly answered from downtown and Vidal fed Dragic for an easy basket, good for a 56-65 Unicaja margin. Alba couldn't find the way to the basket until Morley hit a jump hook. Zoric buried back-to-back five-meter jumpers to give Unicaja its first double-digit lead, 58-69. Unicaja started to use longer possessions to run the game clock down and kept dominating the game with outstanding defense. Djedovic made free throws and Avdalovic added a layup in transition, but only managed to bring Alba within 62-70 with over two minutes left. Unicaja didn't panic, however, as Zoric hit foul shots and Gist had a huge block against Djedovic. 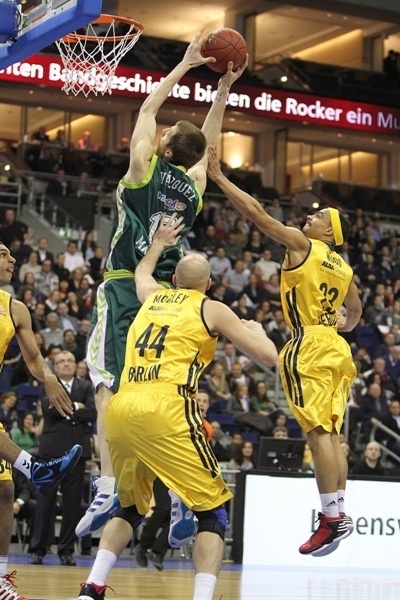 By the time Zoric scored again, the outcome was already clear, 62-74. Unicaja added another road win. In the closing minutes, a knee injury to Avdalovic left all Alba fans worried. "Congratulations to Malaga for this deserved win. We did not reach the needed level tonight. 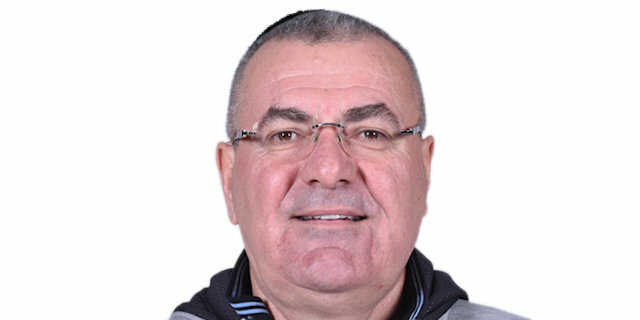 It is hard for me to comment the game after this black week, which culminated today in the injury of Vule Avdalovic, which can be a big hit for us. My biggest concern now is not how we lost the game, but how serious this injury is." 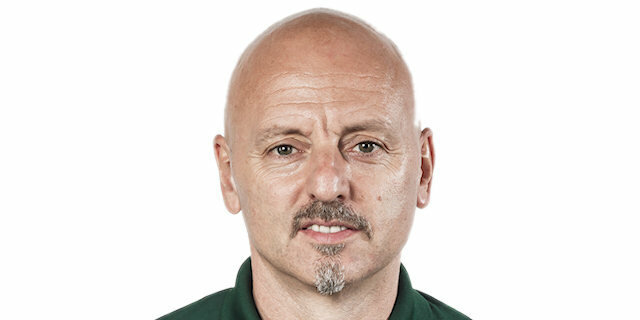 "With both teams qualified it was most important for both teams to finish the game without serious injury problems. But unfortunately that's what happened with Vule at the end of the game. I hope that it is not so serious. We opened the game badly, suffering in rebounding and with bad organization. We definitely changed the game with our zone defense at the end of the thirrd quarter. This was the key moment for our game and our deserved win." "Although we missed some of our key players, I think we played a pretty good game. Only in the end we made too many mistakes, which cost us the game. The injury of Vule puts an even more bitter taste for us to this game." "It's a big win for us. We had a difficult start into the game, but overall I think that we played a strong game. We played good defense in the second half and executed well on offense."